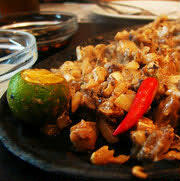 The pork sisig arrived on a sizzling platter. Chunks of chopped fried pork mixed with green chilis and onions. We were told this version has no pig ears, but definitely has “pig parts.” The waiter set the platter on our table then cracked a raw egg on top, mixing it in until it was set. Yum. We quickly passed the platter around and dug in. The crispy pork had a vinegar flavor, and each chunk had the right balance of meat and fat. The onions provided nice sweet flavor and the chilis enough spiciness without being too hot. The egg added depth to the many flavors of the dish. What a melange of sizzling goodness! By the time the next sisig arrived, the pork sisig was already gobbled up, long gone. 1. The Pig’s ear should be thoroughly cleaned with salt and calamansi extract with plenty of water. 2. Boil till tender in water, salt and bay leaves. 3. When Pig’s ear is tender, broil over charcoal. 4. See to it that all portions are chopped in even sizes. 5. Season with calamansi extract, salt, pepper and MSG. 6. Add chopped broiled chicken liver and chop in even pieces the same as pig’s ear. Next Do the Chinese really work harder than everyone else?